#1. 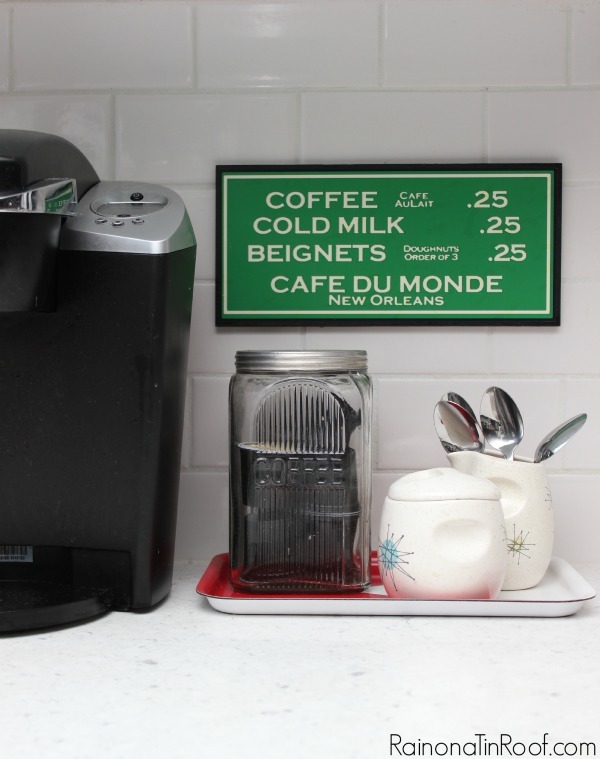 Create a coffee station. This coffee station has only been around for the last few months and let me tell you it has made my morning coffee ritual so much smoother. You see, I tend to want my morning coffee faster than the Keurig can make it. I know – that’s like the purest definition of impatientness (which probably isn’t even a word) ever. It is what it is. I corralled my K-Cups, sugar, and spoons all on a cheap little IKEA tray to get my coffee in my mug as soon as possible. The only thing that isn’t there is the creamer in the fridge. Obviously, its not realistic to leave the creamer sitting out overnight uncovered, so I used that pitcher for my spoons. The little Cafe du Monde sign is a nice reminder of my favorite city in the world. #2. 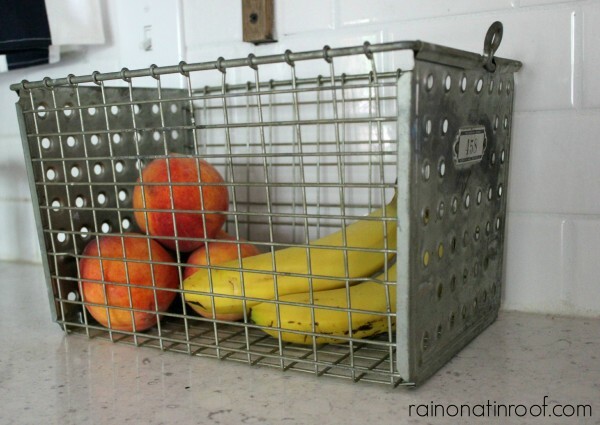 Use a locker basket to hold fruit. I hate those banana hanger/holder things. I have no idea why, but they drive me crazy. Instead, I use a vintage locker basket to hold all our fruit. #3. 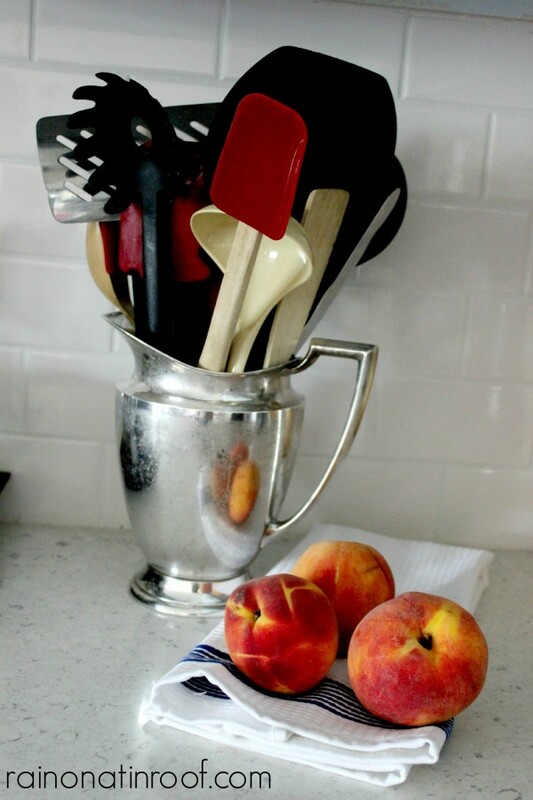 Use a shiny pitcher to hold cooking utensils. When I found that silver pitcher at Goodwill, I nearly peed my pants. 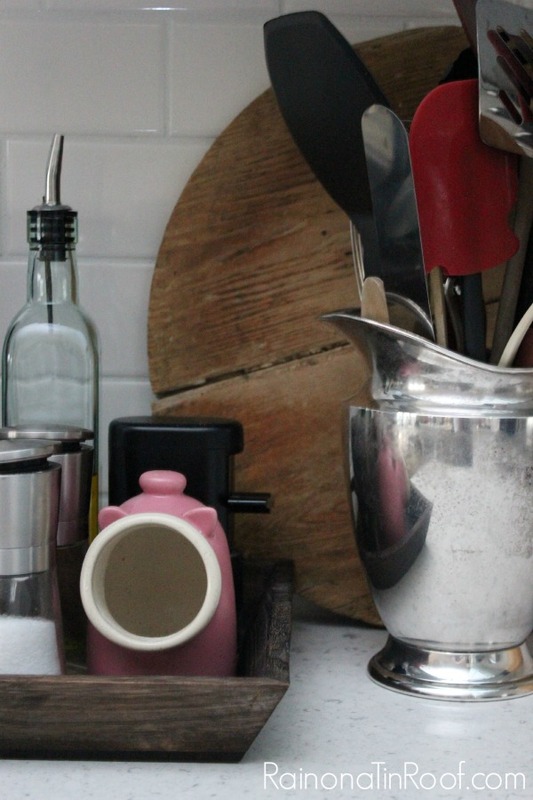 It does the job of holding all the ugly cooking utensils, while adding a touch of chic. #4. Use a tray to corral salt, pepper, olive oil, etc. Right beside the silver pitcher is a small rustic-y tray that holds salt, pepper and olive oil. The tray keeps everything corralled in one spot and makes them feel unified. #5. Bring in color with barstools. Lots of kitchens lack color. In fact, just about everything in my kitchen is black and white except for the barstools and curtains. In terms of furniture, barstools are pretty cheap, which makes them a perfect candidate for color. 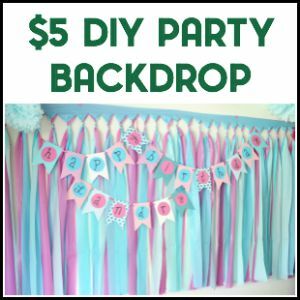 Buy a cheap pair at Target and spray paint them or scour thrift stores for some to makeover. 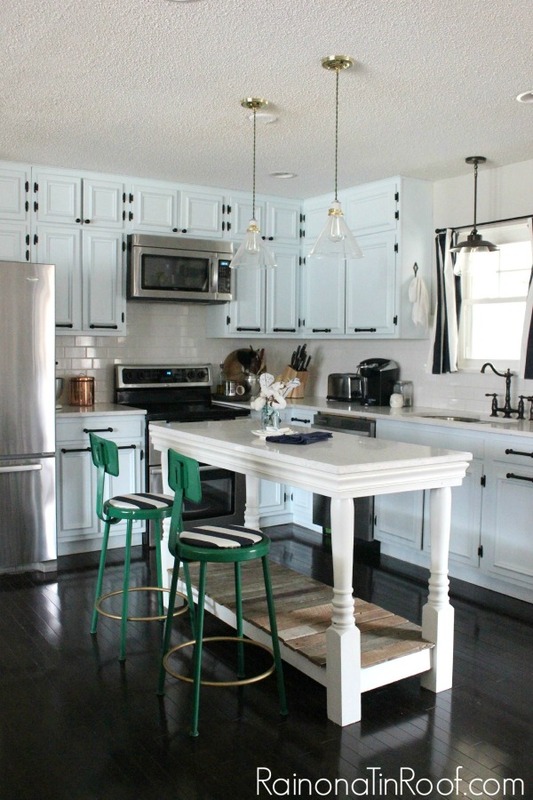 I gave my barstools a kelly green and navy blue makeover a couple years back and I’ve been in love ever since. #6. Switch out your hardware. Granted, I painted my cabinets and switched out their hardware, but never underestimate the power of just switching out hardware. 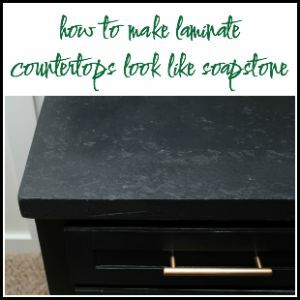 Grunt and I did this at our little cottage and it totally changed the look of the entire kitchen. We probably spent less than $50 on new hardware and it had a big impact. 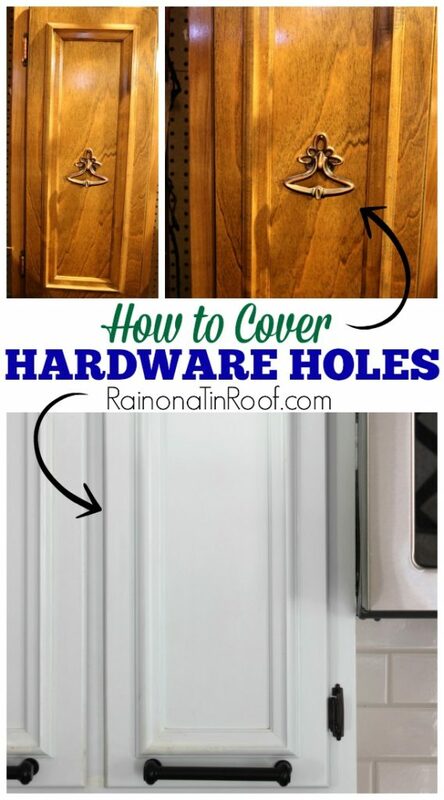 You can even change the location of your hardware and cover the holes easily. #7. Don’t want to trade out your hardware? Try restoring it. 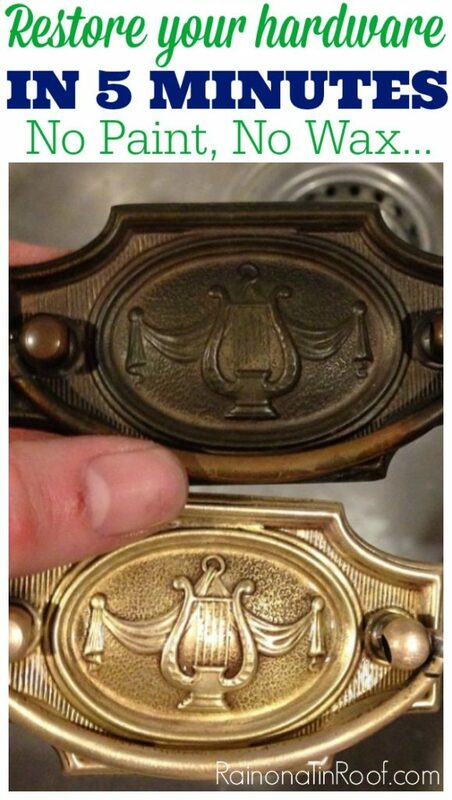 If your hardware is pretty old, chances are, it could use a good cleaning. Clean it up and you might realize you have a little gem under all the grime. Here’s how to restore your hardware. #8. Build your own island or peninsula. Yes you can. I know some of you were just like, “No way can I make my own island.” Y’all, if Grunt and I can, anyone can. Our kitchen island (in the photo with the barstools earlier) was made from porch posts and salvaged barn wood – and it only costs about $100 to make, excluding the counter. 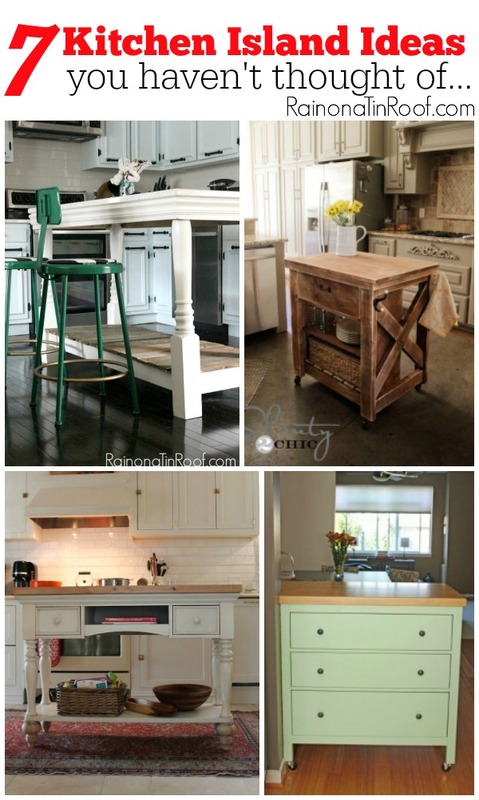 And if you don’t want to build one, look at these seven different kitchen island ideas – you can even use a dresser for an island. #9. Have fun with sweets. 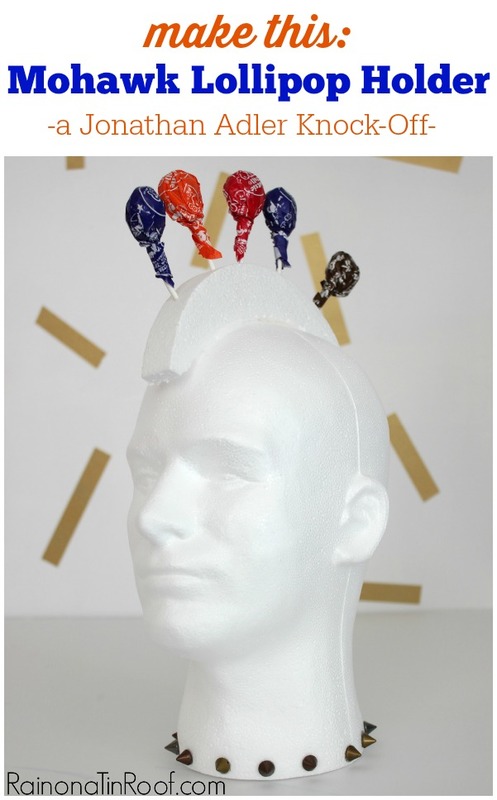 This mohawk lollipop holder is definitely not all that kitchen-y. Its not really even needed. Buts its fun and quirky. And I like that. The kid especially loves getting her lollipops out of the mohawk. #10. Use locker baskets for cookbook storage. 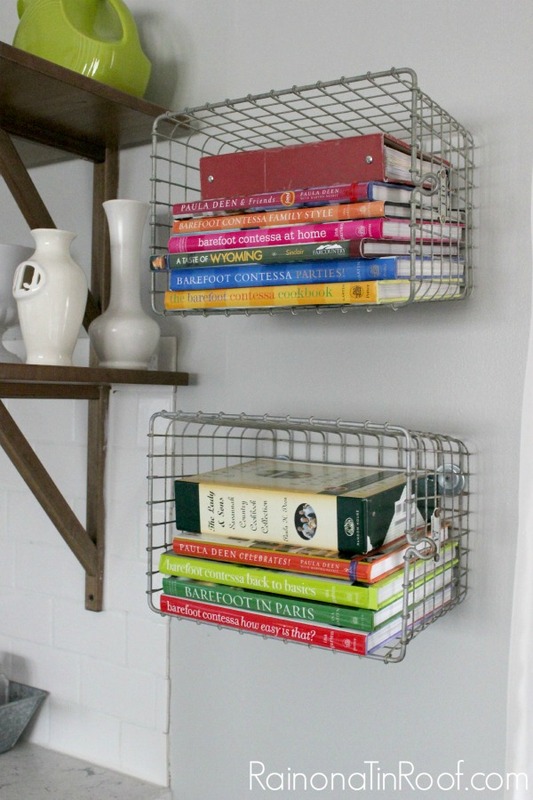 A kitchen ideas post wouldn’t be complete without my vintage locker basket cookbook storage. Almost three years and they haven’t budged. #11. Ditch some upper cabinets for open shelving. When Grunt Labor and I started the kitchen reno, I knew I wanted open shelving somewhere. Originally, I wanted it on both sides of the window (and would still like that), but there wasn’t enough space for the shelving we bought from IKEA on the left side of the window. The shelving is pretty and functional. In the photo above, its holding my whiteware, but now it actually holds dishes and glasses. 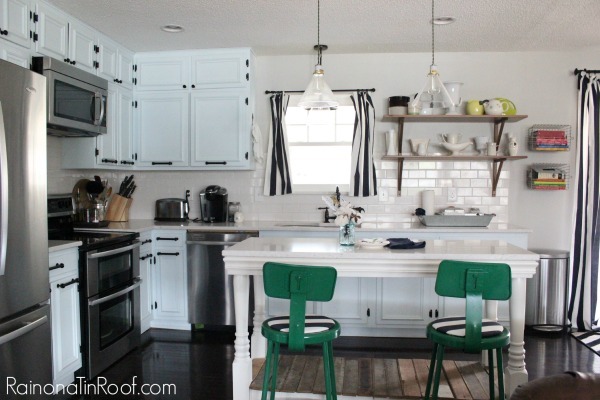 You can see our entire kitchen renovation here. What are your best kitchen ideas for decorating, organizing, and storage? 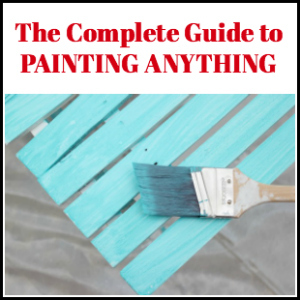 Want more real life decorating ideas? 14 Real Life Bedroom Ideas Anyone Can Do – totally doable, totally real life. 20+ Living Room Ideas – for every kind of design style. I love that idea, Chris! We have a big galvanized tray on top of ours that my mother-in-law got for us and it holds everything on top of the fridge – you can just still see the chip bag popping out! haha! It is what it is! Oh Jenna, I love your kitchen. 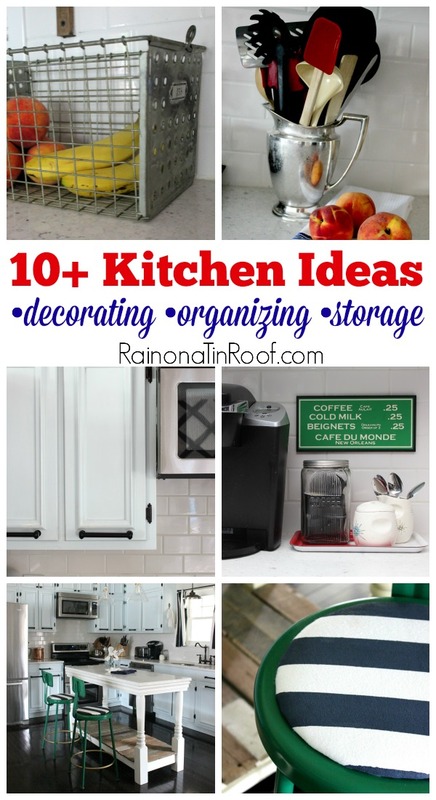 Great organizing ideas as well! We have the same sugar and creamer set!!!!! I’m not even a fan of mod 60’s stuff, but I found four small plates with that design in a junk shop for $1 years ago and now have several pieces from that line. They’re just so cute! Love all your ideas and your kitchen is so pretty! Thanks, April! Those actually belonged to my great Aunt and I have some of the plates that go with it as well! Its a fun pattern! Thank you, Robin!! That really means so much to me! I like your storage solutions! My fave is the coffee station. Support your idea about “all in one place” system. All the best, Storage Cricklewood Ltd. 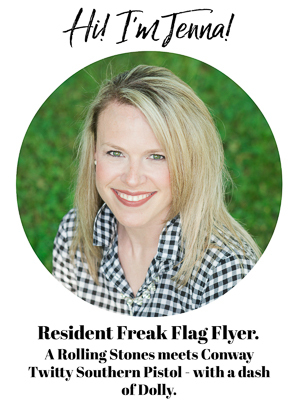 Thank you for the article, Jenna! Your idea for bringing more color with the barstools is genius – when I am tired with their color I can always repaint them! Thank you again for the inspiration! Awesome, Cindy! Glad it was helpful! HI… brand new to this site! I love it! I collect all kinds of things most think are junk. I spend a lot of time day dreaming of what to do with a lot of it cause there are so many options. THANK YOU you agged me on to a new level! Awesome, Melody! I just love agging people on! haha! Great looks! Thanks for sharing at Home Sweet Home!